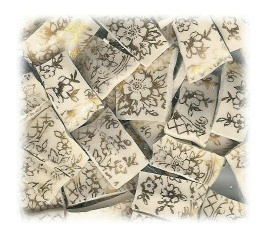 8 oz bag of gold filigree tiles from china plates. Gold filigree on off-white china. Please note that the picture is a REPRESENTATION of the tiles you will receive. However, each 8 oz bag contains tiles from the SAME plates. If you are ordering more than one bag and want to be sure that all the bags contain tiles from the same plates, please email us so we can check inventory and send pix, if you need them, of the actual tiles you will receive. The OCCASIONAL piece may have some discoloration and/or crazing. Mix of rim and non-rim tiles.